Technically more like an antelope than a goat, the mountain goat is one of the best mountain climbers on Earth, braving terrain that even humans scarcely attempt to traverse. Because of his unique adaptations, the agile, nimble-footed beast is able to quickly scale the mountainous, rocky habitats in which he lives. 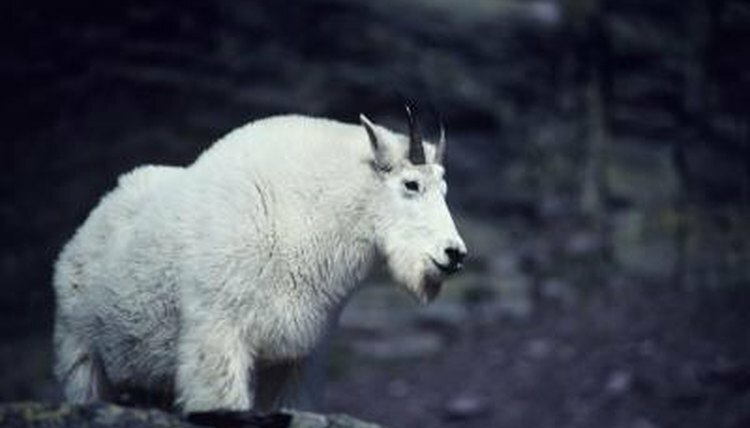 The mountain goat is uniquely suited for living in this type of habitat, moving up and down the mountainside with apparent ease. With a body built for climbing, the mountain goat is a particularly speedy animal when navigating rocky, uneven vertical terrain. A mountain goat can climb more than 1,500 vertical feet in 20 minutes -- that's higher than the Empire State Building, and he does it without stairs. This ability to climb rugged, mountainous terrain so quickly, gives the mountain goat his well-earned reputation and his name. The mountain goat is quick and agile in part because of his hooves. He has cloven hooves, and he can move the two toes of each hoof independently of one another. Not only that, but each hoof is equipped with soft, textured, rubbery pads on the bottoms, which give him superior grip. It's as though he is wearing professional climbing shoes on all four hooves at all times, allowing him to hold on to the terrain beneath him with ease. The mountain goat gets some of his agility from his powerful, muscular bodies. The mountain goat's body is stronger in his forequarters, particularly his shoulder muscles. These muscles function like a human's upper body strength -- he is able to pull himself up the side of a cliff by gripping with his dextrous hooves and lifting up his body with his shoulders. While his hindquarters are not as developed, they're still strong enough to make him a precise, agile jumper a mountain goat can clear 12 feet in a single leap. While mountain goats are fast, nimble climbers, they are not necessarily as quick on flat land. This is because their bodies, with their highly developed forequarters and comparably less muscular hind legs, are simply designed for vertical travel rather than horizontal. They are strong, steadfast climbers and accurate, agile jumpers, but that does not translate to high-speed running on the flat. Do African Sulcata Tortoises Have Ears?